YOU CAN WIN OVER $6.2 MILLION! Fly Casino now has Jackpot Giant. It’s the BIGGEST progressive online slot game. Jackpot Giant is 50-Line game with fixed wagering options. Set in the Stone Age era, the game features two variations of stacked symbols. They are displayed as the giant himself behind a volcano and behind trees. The stacked symbols will occupy two vertical reel positions that can trigger massive wins. 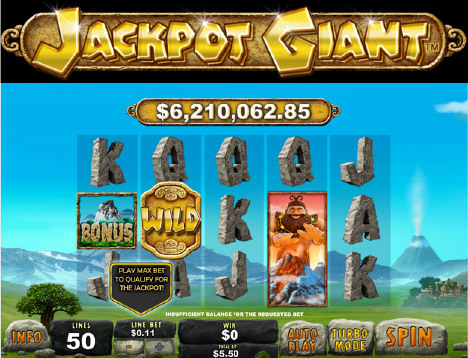 Giant Jackpot feature is really what this game is all about – The big jackpot is triggered when you bet the maximum lines/wager and get a five wild symbols on payline #1. This will reward the progressive jackpot which currently ticks at over $6.2 MILLION! Enough of a reason to play? We think so too! The bonus volcano symbol appearing on reels 1 and 5 will trigger the Giant Bonus feature. You will be taken to a screen that reveals six volcanoes to select three of them. Each of them represents a cash prize in additional to ‘Extra Pick’ or the ‘Win All’ picks. $30 Gets $40! From 00:00GMT until 23:59 GMT, all members on their deposit of $/£/€30 or more will receive a $/£/€40.00 bonus! Claim 2X! 120% BIGGER TUESDAY! From 00:00GMT until 23:59 GMT, all members are invited to receive a 120% bonus up to 240.00 on your first deposit of $/£/€ 50 or more.